Good news for haters of the nanny state: New York City’s new law requiring calorie counts on chain restaurant menu boards doesn’t appear to be making any difference. In fact, it might be causing people to eat more. and if they’d changed their selection because of it. Then they got receipts from each respondent so they could find out what they’d actually purchased. The results were pretty dismal: only about half the respondents even noticed the calorie counts and only 15% said they influenced their choice. 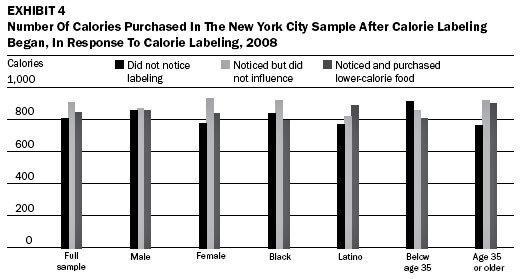 But the receipts told an even more dismal story: overall, people actually purchased more calories after the law went into effect. The results aren’t statistically significant, though, so basically all the researchers can really say is that the law (so far) hasn’t had any effect. The only glimmer of good news is that among people under 35, respondents who noticed the labeling did seem to cut back a bit. No other subgroup showed any effect. So who knows? Young people probably respond to this kind of thing more quickly than older people, so maybe it’s just going to take some more time before all this stuff sinks in.